Another two-for-one wine post. 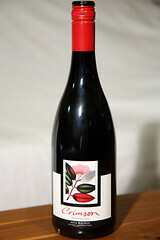 The Pinot Noir is by Ata Rangi in Martinborough, New Zealand, vintage 2008. I really liked the previous Pinot Noir I had, so it was good to try a different one. We took this bottle to a local pizza restaurant. The colour is a striking transparent crimson red. The aroma I didn’t get a good handle on I’m afraid – it was mostly a heady alcoholic smell, with nothing else I could really recognise apart from the usual “red wine” smell. The taste, however, was a triple-layered development of flavours. At first it was very dry and mild, and both M. and I detected the slight prickle of fermentation. I understand this is usually considered a fault in red wines, but pinot noir seems light enough that it doesn’t seem astray. The overall effect was quite un-wine-like, with almost a chalky feel to it. In fact, it reminded me of the taste of a soluble aspirin. But after a few seconds, the flavour developed into a pleasant fruity number, mostly reminiscent of raspberries. Leaving it sit in the mouth for a while longer started to bring out some mild tannin. 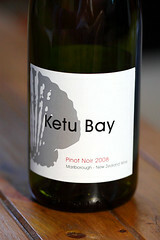 Overall I’d say I was happy with it, but perhaps not as nice as the previous pinot. Today’s second wine is an icewine I bought on our recent day trip to the Blue Mountains. It’s from Orange Mountain Winery, near Orange in inland New South Wales. They freeze the Viognier and Chardonnay grapes artificially to concentrate the sugar for this sweet dessert wine. 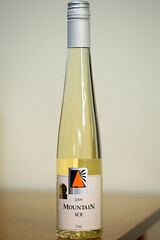 A sticker on the bottle says it won “Best Icewine” at the 2009 International Sweet Wine Challenge. It’s a gorgeous luminous pale straw yellow in colour. The smell is of citrus fruits, with orange and lemon coming out. But the taste is very different, being strong tropical fruits – passionfruit and pineapple, with a touch of orange. And it’s exceedingly sweet – possibly the sweetest wine I’ve ever tasted; I certainly can’t recall a sweeter one. All of which make it delicious and more-ish. I want to see if I can find more of this one! We had this at home with a platter of brie, jarlsberg, and a cream cheese with apricot and almond in it, on crackers. What better dessert could you want?